Unions fight for the rights of workers. But those battles are more often fought these days on picket lines, in contract negotiations, and through media coverage. 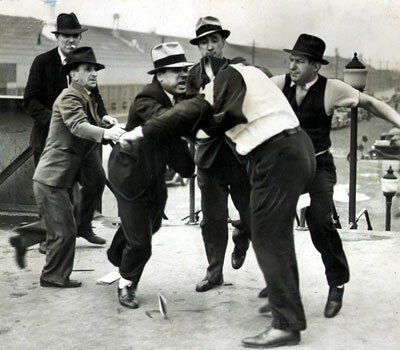 However, violence and intimidation against union organizers and members can be found throughout labor history—and May 26th’s historical event was one of the most significant examples of that; a battle that ultimately cost the capitalists their cover-up of lies and deception. This battle took place outside Detroit in 1937. The setting was Ford Motor’s Rouge Complex, a huge Dearborn industrial park on the Detroit River. 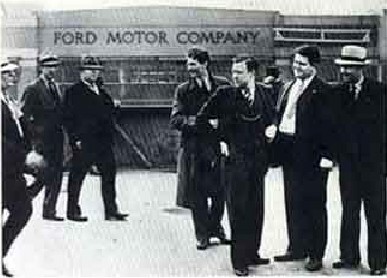 Walter Reuther and other UAW organizers were at the complex to show their solidarity with Ford workers as they attempted negotiations for better pay and shorter hours. A leaflet campaign had been prepared, and the press showed up to cover the event. What happened next—unfortunately for Henry Ford—was captured on film by a Detroit News photographer. In 1937, the infamous Harry Bennett was in charge of security for Ford Motors. He was, essentially, Henry Ford’s “fixer,” a former boxer. Ford hired Bennett after asking him a single question: “Can you shoot?” Bennett was tough and paranoid. He had built himself a home on the Detroit River that was a veritable fortress. Styled like a Chinese pagoda, it had hidden tunnels, an interior stair that went directly down to a dock under the house and complete with getaway motor boat, and a moat ringed with explosives ready to be triggered. Bennett also built himself a northern Michigan home that had the same features, only it was built to look like a gigantic log cabin. Bennett created a security force for Ford, called “service men,” that was composed of former athletes, Detroit gang members, and ex-convicts. 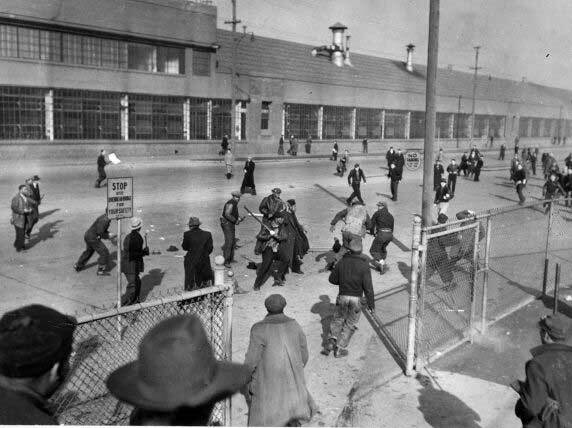 It was this security army that had opened fire along with police on auto workers during their Ford Hunger March in 1932, killing five and wounding 60. Henry Ford wanted the press to be sympathetic to him in his fight against the workers that were asking for an extravagant two dollars more a day in pay. So Bennett hosted a lavish breakfast feast for the media at the beginning of May. Some of those same reporters and photographers turned up to cover the UAW presence at the Rouge Complex on May 26. Reuther, Richard Frankensteen and other UAW organizers posed for News photographer James Kilpatrick on a pedestrian overpass that led from the plant to the parking lot. Bennett arrived with 40 of his security force. The service men immediately attacked and began to beat the union negotiators. Reuther was thrown down one flight of stairs on the overpass bridge, kicked and punched, and then thrown down a second flight of stairs. Frankensteen’s jacket was pulled up over his head and then he was savagely beaten. 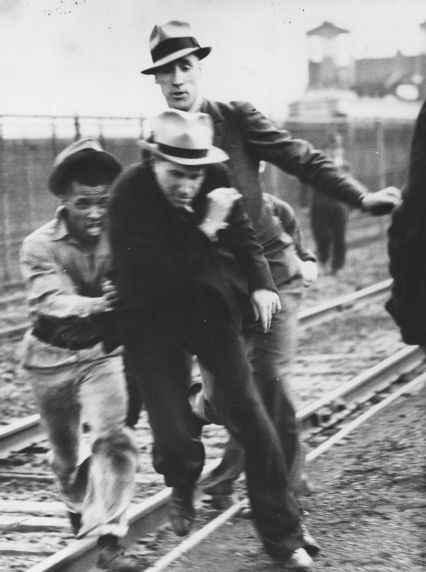 One union organizer had his back broken by Bennett’s thugs; he was thrown off the overpass and landed 30 feet below. Members of the women’s auxiliary of Local 174 had arrived to start passing out the leaflets to workers as they came off shift. These women were also attacked and some beaten as well. Dearborn police officers stood by and watched. Later they explained that Bennett’s security forces were “defending private property” and they did not want to interfere. Bennett’s attacking security officers then turned on the members of the press who had attended the event. Reporters had notes ripped from their hands. Cameras were smashed. Film was confiscated and burned. One reporter was chased by a group of “service men” for five miles before he finally ducked into a police station, into which the attackers did not follow him. But Kilpatrick, the News photographer, escaped and managed to protect the glass-plate negatives of his photographs. He hid the real negatives in his back seat and surrendered some blank ones to Ford security before making his getaway. Bennett declared to the media, “The affair was deliberately provoked by union officials…I know definitely no Ford service man or plant police were involved in any way in the fight.” The News photographs, however, told a different story. Detroit, and the nation, had been told for years by the media that the capitalists had their workers’ best interests at heart. 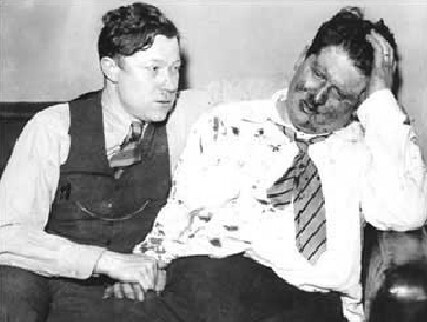 For example, in January of 1937, Reuther and other organizers along with GM workers were gassed, wounded with shotguns, hosed with fire hoses, and beaten during a sit-down strike, but details of this barely reached the newspapers. But when confronted with the visual story of Kilpatrick’s photos, the public learned a harsh lesson about the real level on which the battle against unionization was being fought. The outcome of the Battle of the Overpass was the negative attention it brought on Henry Ford and the way he treated his workers. Called before the National Labor Relations Board, Ford had to answer charges involving dozens of unfair labor practices in his violation of the Wagner Act. Ironically, the members of the press gave the most damning evidence at the hearing. Ford lawyers tried to undermine the negative effects of their words by asking questions like, “So, you’re a communist?” when reporters gave their credentials as a members of the Newspaper Guild. Prior to the hearing, Henry Ford tried to head off bad publicity by raising worker pay by $1.50 a day, an announcement he made immediately after the “battle” ended. But the opinion of both the National Labor Relations Board as well as the country went against him and forced him, three years later, to sign a UAW contract. As an added insult to Ford’s humiliation, Detroit Labor party candidates won twice as many votes as other candidates combined in the election following the May 26 battle, and swept into a majority. The Pulitzer Prize committee was so impressed by the importance of James Kilpatrick’s photographs as a record of the truth that it instituted the Pulitzer Prize for feature photography shortly after the Battle of the Overpass. Today, we are watching our state’s governor, abetted by the Michigan legislature and the Mackinac Policy Center, hard at work busting unions and preparing to overturn union contracts at will. We need to remember that the rights of worker are never going to be secure in a capitalist system. Like the Battle of the Overpass, the culmination of years of workers standing up to intimidation tactics by auto executives, we too are standing at a pivotal moment in labor history. The strength of workers to confront these tactics is in solidarity and the courage to topple the capitalists by exposing the truth of their agendas. So speak up. Take action. And the next time you attend a protest or a labor march, be sure to bring your camera. The people who had non- union jobs at Ford Motor Company, should have been happy that Mr Ford had created his company in the first place, so they could have a job! What the unions did to Ford was greedy and as we well know today is nothing more than a power grab by leftist. Unions buy the votes of workers under the guise of workers rights. Unions should be abolished throughout the United States. Yeah Right, all of these workers should of been happy to work for next to nothing all of their lives. You’ve had it way to easy son. Time to break away from your parents and go out in the world on your own. You know nothing. if you dont like it make your own damn company. stop whining. Nobody is Whining Bud. You need to GROW UP. Your nothing but a spoiled little brat who still lives off your parents. You wouldn’t know a real job if it ran you down a million miles an hour. I worked 7 days a week from 19 years old until 41 as a Thoroughbred Groom working with race horses. I’m 55 and retired. Came from a hard working large family, some relatives worked damn hard on the line at Chrysler. They earned every last penny they worked for. Try it for a living instead of letting your mommy & daddy pick up your tab in life. Nearly 80 years ago, the Battle of the Overpass was a national PR disaster for Ford Motor Company. Nearly 80 years ago, the Battle of the Overpass was a national PR disaster for Ford Motor Company. | Car Auctions - All Makes And Models!